I’m presenting Introduction to Memoir Writing. I will teach the fundamentals of memoir writing, with interactive writing exercises to evoke the places, people and events of your memory in a compelling fashion. What Credentials do I have to Teach Writing? 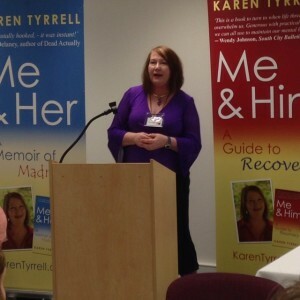 My name’s Karen Tyrrell, award winning author and publisher of six books ( 2 memoirs and 4 children’s books). I present writing workshops and seminars for Queensland Writers Centre, Moreton Bay Libraries, Logan City Libraries, Toowoomba Writers Festival, River City Writers Conference, CYA Conference and Gold Coast Writers Festival. I’m a teacher with over 25 years of experience. What Credentials do I have to Teach Memoir? I’m the triple award winning author of Me and Her: A Memoir of Madness and Me and Him: A Guide to Recovery. I won a mentorship with the Society of Editors. These memoirs reveal a teacher’s recovery from parent-teacher bullying and mental illness. Do you write Memoir? Do you know someone who does? Please Share, Comment, Like, google or tweet.